Over just the past month, Verizon Wireless launched their 4G LTE network in 38 major cities last month as Sprint reached nearly 71 cities including San Francisco and New York City. However, despite the strides these cellular carriers have taken, much of the United States is still left uncovered. Even for those who live in a 4G city, coverage is still spotty. In addition 4G networks don’t work too well inside buildings. To help ease the issue, Wilson Electronics announced a few new 4G signal boosters at Consumer Electronics Show, much like their 3G signal booster we reviewed last year. The company offers three versions of 4G signal boosters for LTE, WiMax, and AWS frequencies which are for Verizon Wireless, Sprint, and T-Mobile, respectively. For those unfamiliar with signal boosters, keep in mind that these don’t magically create signal if you don’t have any coverage. These gizmos pick up and strengthen weak signals to improve speeds and quality. The AWS 4G booster designed for T-Mobile’s HSPA+ network will ship sometime next month and will retail for about $400. 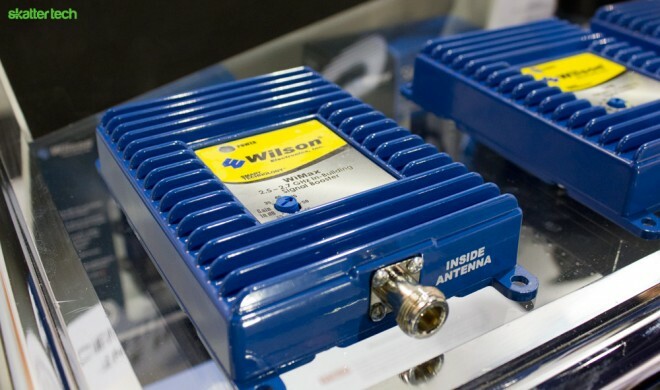 As for the LTE booster, a Wilson Electronics representative stated that further refining and testing is needed since Verizon’s 4G network is still fairly new. Other models including the Sprint WiMax edition will become available later this year.